Is it your child’s birthday coming up? Hosting it at home? We’ve got all of the children’s party supplies you’ll need to make it a hit. Start the planning right, with our invitations and party packs. Some of our popular goodies include Baboushka invitations, touchable bubbles, icecream and flamingo candles, bracelet braiding kits, and police/nurse costumes. 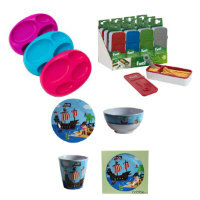 We also sell a range of kid’s kitchen playsets and accessories – from cookie cutters and baking sets, to kitchen gadgets and dinner sets. Your kids will love feeling all grown up, just like you. 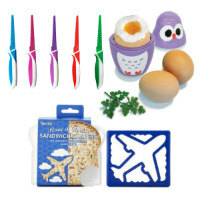 There are egg cups shaped like owls, alphabet and lettered cookie cutters, ABC fork and spoon cutlery sets, bamboo dinner sets, Disney Frozen placemats and dinner sets, snack boxes, the Gruffalo plate sets, rocket man baking sets, butterfly cookie cutters, Christmas cookie cutters, and fire engine and ice cream truck plates. 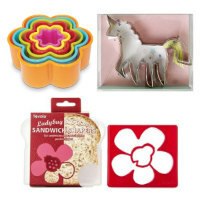 We could go on for days about our wide range of children’s party supplies and kitchenware. It’s best for you to browse through it all yourself, so you can find those unique party goodies. Even you’ll impress yourself at just how awesome your party table will look with all the unique children’s utensils and decorations. There’s something for boys and girls, of all ages and tastes. Make their dinner sweet enough that they won’t even ask for dessert – with our bear, chick, bee, bird, squirrel, monkey, pineapple, and sweet pea dinner plates. You don’t need to worry about safety either. All of the utensils are safe for kids. Take our Space Monkey dinner set, for example. It’s 100% organic, BPA free and it’s recyclable. It’s also heat, stain and water-resistant. Order your children’s party supplies from us today. Make it a party they’ll always remember.